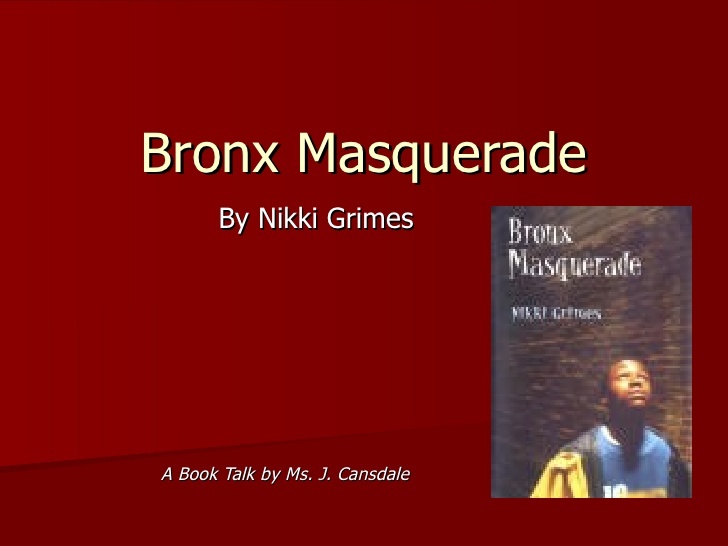 Bronx Masquerade is a book written by Nikki Grimes, one of her vast collection of children’s books. Nikki Grimes was born and brought up in New York and started her writing as young as six years of age. Her poems did not, however, come to light until the age of thirteen when she read some of them at a local public library event. Other than poetry, Grime is also known to write adult verses for magazines such as Today’s Christian Woman, Image, Essence, Book Links and Journal of Arts & Religion. Due to her contribution to literature, Grime has received awards among them the Coretta Scott King Author Award in 2003, NCTE Award for Excellence in Poetry for Children and Laura Ingalls Wilder Medal this year (Penguin publishers). Bronx Masquerade is a book based on poems of eighteen high school students. The book is set on a high school poetry class where the teacher starts an open-mike program every month but due to the passion students show, the teacher increases the open-mike program to every Friday of the week. The program begins with Wesley a student who writes a poem instead of the essay as directed by the teacher. The students identify with his poem and therefore see it as an opportunity to express themselves removing their “Masquerades” without the fear of being judged. Through the open mike program, the eighteen students pour out their issues at home, the confusion in life and their hopes for the future a vulnerable position to put oneself. Grime artistically expresses different personality in one book which is an exceptional work of art. Her integration of self-narration and expression though poem makes the book personal for anyone reading it as one can relate to some if not all of the characters. Her ability to make it sound like eighteen different students telling their own stories brings out the effect where one relates directly with the characters other than in most cases where one relates with the author of the book. Grime use simple English which does not include the sophisticated poetry writing styles following rhyme and other aspects of poetry. Instead, the poems are just a clear expression of one’s feelings using simple language and with which one can read and understand the content other than try to analyze the style of writing. In a way this would inspire a reader to try and write their own, expressing deeper meaning without having to write in elegant style. One thing that stood out about the book is that even though the students talk about the teacher, he never gets to speak for himself, we only learn about him through the student’s mentions. Although Grime made the book sound like it was meant for the students where she does not give the teacher a chance to express himself, the book has also given one character more attention compared to others. Tyrone gets to react to each of the poems through a stream of thoughts while us none of the other students get to do the same. The book is well written with a glimpse of every student’s life followed by a poem they compose expressing themselves and the situation in which their life is, currently. Other than that, the book expresses problems of eighteen different teenagers ranging from uncomfortable homes where dad is a drunk to life conditions like physical abuse a teenager should not experience or be exposed to. The book expresses life challenges every teenager faces, one that determines one’s identity. As one reads through each and every student’s story, one gets to see how difficult life can be yet the students still push on and attend classes. The book in a way encourages people not to give up no matter the situation they face. The book brings out a connection between the characters and the reader. It is a book that every teenager can relate to and therefore I would recommend anyone to read it.